> Time now to put Mouse Guards on your hives! Well the weather is noticeably cooler now and that means your bees will begin to huddle together to keep warm. Their movements will be considerably slower to conserve their energy and food supply. This is when an inquisitive mouse looking for a nice warm place to spend the winter will crawl through the entrance of your beehive. Apply a Metal Mouse Guard. This is a commercially produced metal strip with small 10mm bee size holes in it. If you have an entrance block in place to reduce the entrance size to keep wasps out, now you can remove this block. Fix the mouse guard in place with drawing pins across the entire hive entrance area. If you have a WBC remove the wooden slides and insert the mouse guard behind the porch entrance. Your bees will be able to enter and exit, but the holes are too small for a mouse to fit through. Even if you think there are no mice in your apiary area- they will find your hive. Remember to check the entrance every week for the next few months to clear any dead bees away from the floor and entrance. At this time of year the natural bee mortality rate is high and this could pile up, blocking the exit for the remaining bees. We make up long bent sticks to scoop any fallen dead bees out of the entrance. It’s quick and easy and does not alarm the bees if done gently. 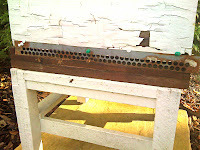 In the spring once the weather has warmed up and your bees are flying again, remove the mouse guard. Clean it with hot water and soap and store away until Autumn.